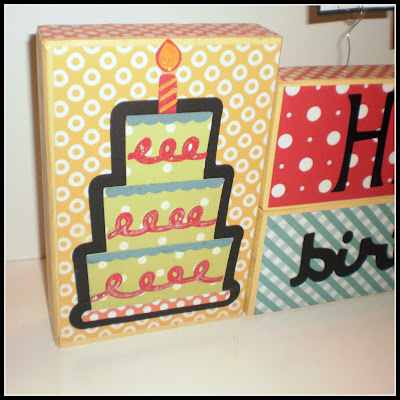 Crafty Girls Workshop...: Birthday Blocks Giveaway! I showed you all these great birthday blocks a few weeks back. Well, I have a couple of these kits left and so, I thought I would give one of the kits in this giveaway and throw one up in my Etsy store. I made up the last two kits, so the giveaway is for a finished kit. If you win, you will receive what you see in the picture (less the fabulously kit kid picture! 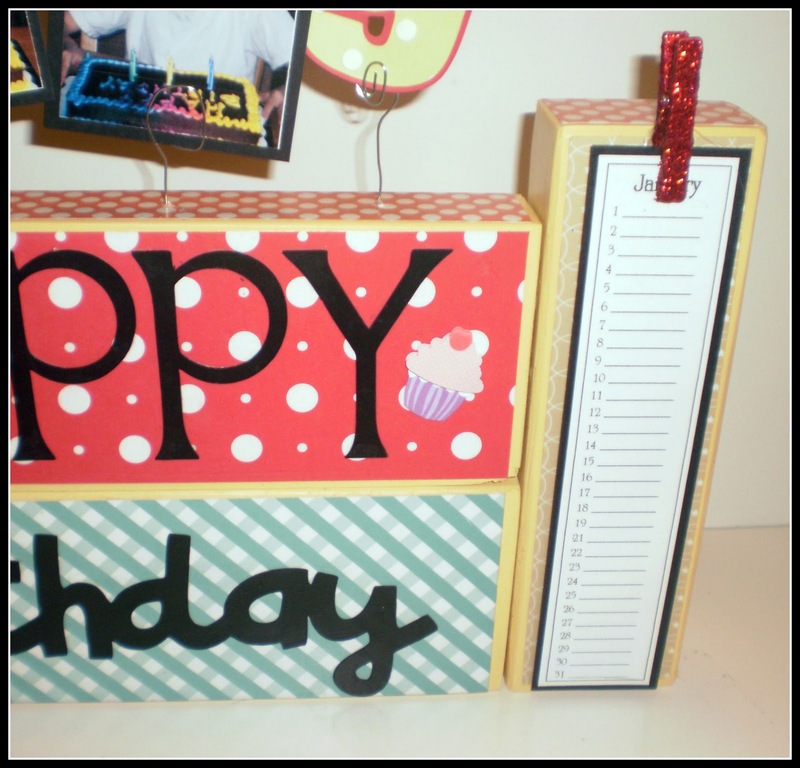 This Happy Birthday block set is a perpetual birthday calendar. There are four blocks total. The first block measures 5.5 inches wide and 8 inches tall. 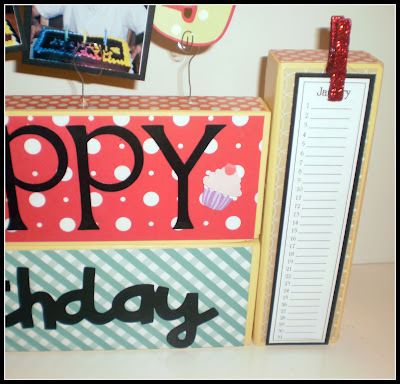 The two center blocks that say Happy Birthday both measure 12 inches wide and 3 inches tall. And, the final block that holds the monthly birthday printout measures 2.5 inches wide and 8 inches tall. Giving the total piece a measurement of 20 inches wide and 8 inches tall. 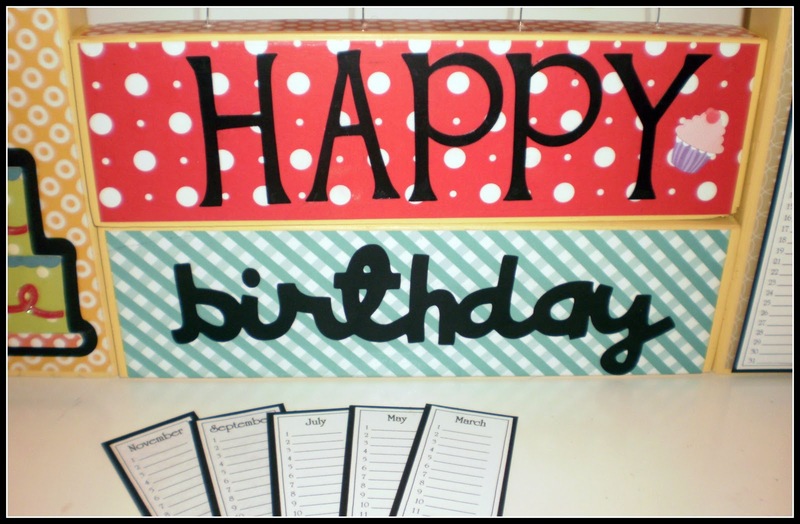 Each month you could display in one spot, everyone's birthday for that month. 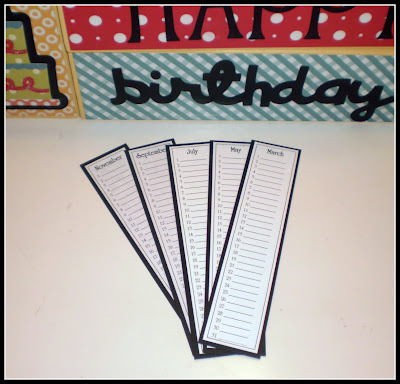 The monthly cards are stored conveniently in an envelope on the back side of the "Birthday" block. Personally, I think that this block set would be great for teachers. 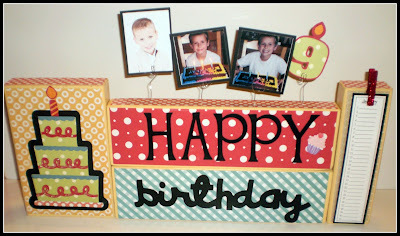 Each month you could display a picture of the child whose birthday it is. There are 4 photo holders on this kit. This would also work great for church children's programs. Ok, the rules for the giveaway! 1. 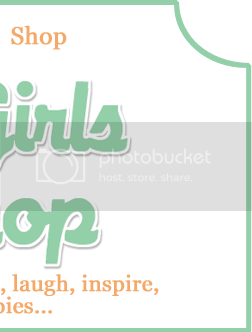 Become a follower of Crafty Girls Workshop. 2. 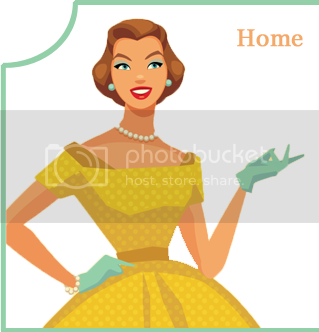 Become a follower on Facebook (button on sidebar). 3. 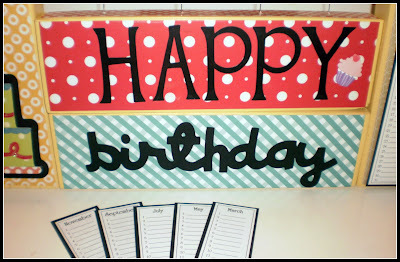 Leave me a comment on what you want this year for YOUR birthday. That's it. Super easy. So, enter now...because hey, who doesn't love something free! I will close this giveaway on Sunday, February 6th and announce the winner on Monday, February 7th. If you are the winner, you will have 7 days to email me with your mailing info. Also, I can only mail to the United States. I am also already a follower of Crafty Girls Workshop on FB...that's how I heard about give away. What I want for my birthday this year...that is a hard one I am already so blessed. Probably a gift card that I could use to by fabric. 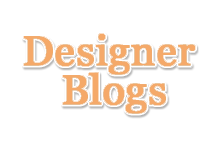 I follow Crafty Girls Workshop Blog!!! I would like some beautiful fabric! These blocks are adorable. If I don't win, I will have to recreate this!! I am a follower and truly enjoy your posts. I am a follower on FB. For my birthday this year (in 2 months) I will be attending a crop. Yah Hooooo! What do I want??????? A donation towards a Scrapbooking Cruise I hope to take next year. Oh I haven't even thought about my birthday since it was at the end of December. But I suppose I might ask for a Sillhouette.... :) That is in my wildest dreams too! I'm a follower and like you on FB :) My birthday is Feb 6th. 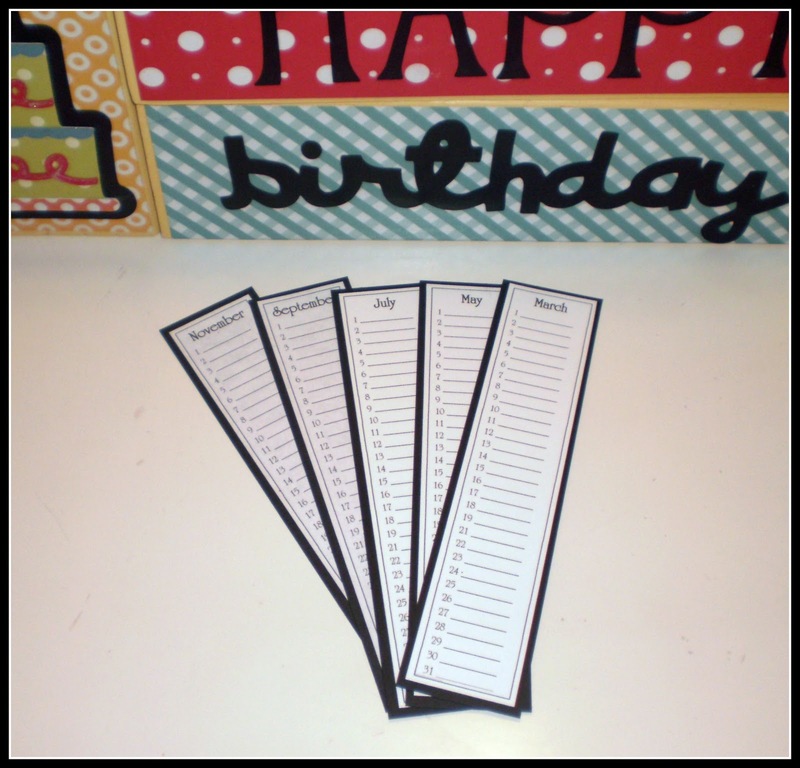 For my birthday I'd like gift certificates! 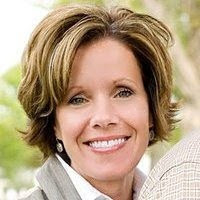 I signed up for your newsletter email and became a FB follower...this year for my birthday I would like a new camera lens. I am the room mom for my 2nd graders class and I think these blocks would make a great teacher gift during our Teacher Appreciation week! I want an iPad for my birthday this year! I'm a follower! Just found your blog! For my Birthday I'm asking for my sewing machine! I follow you thru Google Reader. Thanks for the giveaway. I've already had my birthday this year - I asked for a work table for my craft room - I got one! Thanks for the giveaway. Well since my Birthday is coming soon...15th...I want a new laptop.